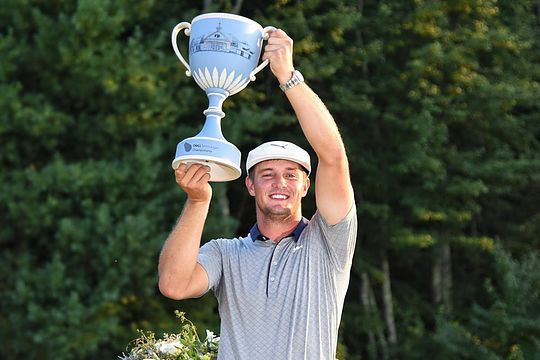 Bryson DeChambeau defeated England’s Justin Rose to win his second event in as many weeks to take control of the season-ending FedEx Cup Series. A fortnight ago in New Jersey at the Northern Trust Open, DeChambeau prevailed by four shots and at the Dell Technologies Championship in Boston on Sunday he won by two, again over the best players on the PGA Tour. DeChambeau, 24, outlasted a high-quality leaderboard with a final-round 67 for a 16-under total to claim the title. Tiger Woods was left to chase a rampaging DeChambeau, despite pulling within three strokes during the final round, as were Rory McIlroy, world No 1. Dustin Johnson, and two time major winner this season Brooks Koepka. Justin Rose had four bogeys during a front-nine 37, but shot 31 on the back nine to vault into second place at 14-under, with Aussie Cameron Smith third at 13-under. “I can’t believe I’ve done this so early in my career,” said DeChambeau. You don’t win a US Amateur title unless you know how to win a championship and this was DeChambeau’s fourth PGA Tour win in 14 months, his third of 2018, and in the process he has become the newest member of the world’s top-10. With the win, DeChambeau becomes just the second player since the FedEx Cup’s inception to win the first two legs, the other being Vijay Singh in 2008. No player has ever won three events in the same playoffs, something DeChambeau will have two chances at accomplishing at the BMW Championship and Tour Championship. DeChambeau, who kicked off the year at No. 99 in the world, moved past Rory McIlroy to No. 7 with this win. He also pocketed US$1,620,000 for the second straight week. Cameron Smith is finding his form at the right time of the year with a 3rd place finish as he hunts for his second PGA Tour title. The 25-year-old Brisbane player has enjoyed a solid US Tour season, including seven top-10 results to currently sit 8th on the FedExCup Standings moving eight spots following last weekend’s finish. Smith won the 2017 Zurich Classic of New Orleans and this year secured a tied 5th at the Masters Tournament to earn his second top-10 in a major championship after finishing in a tie for 4th at the 2015 US Open. Add a 5th place finish at the World Golf Championships-Dell Technologies Match Play to his T3 place finish at the Northern Trust last week and Smith is knocking on the door of another victory. Marc Leishman was the next best of the Australians behind Smith in 21st at 8-under while Adam Scott was 49th thanks to an impressive final round 66 which jumped him 18 places up the leaderboard after opening with rounds of 71-71-73. Jason Day missed the cut with rounds of 76-73. All four Australians are through to this week’s BMW Championship in Pennsylvania with only Day and Smith guaranteed a start at the PGA Tour Championship in Atlanta starting 19th September.